Photograph of the interior of Sultan Ghari’s Tomb at Delhi from the Archaeological Survey of India Collections, taken by W. Caney in the 1870s. The tomb was built by Sultan Iltutmish (r.1211-1236) for his eldest son, Nasir-ud-Din-Mahmud, who died in 1228 or 1229. 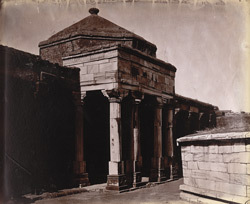 The tomb consists of an octagonal structure in the centre of a walled courtyard with a small mosque on the west side. The architecture of the tomb is very plain and includes masonry spolia from a 7th-century Hindu temple. It is possibly the first monumental Islamic tomb in India as it dates from 1231-2, slightly earlier than the tomb built for Iltutmish himself in 1235. This is a view of the central octagonal cell on the right, with the portico of the mosque on the left consisting of white marble columns.